Screen 1: The top lane represents a second comp take in the track ‘Chorus VOX’. It is made up of the shaded regions of the takes below. The bottom two lanes represent comp takes 1 and 3, portions of which are actually being used in Comp 1. Sometimes that ‘magical’ vocal performance happens in one take, but most of the time we need to splice it together from multiple takes in a process called compositing, or comping. Either way, we should start by recording multiple vocal performances — takes — that become the raw material we sort through to find or build the optimum vocal track. How to approach recording multiple takes depends on many factors, including the vocalist and how to draw out their best performance. A common technique, though, is to loop a section of the song while tracking and have the vocalist repeat the section non-stop, so they can zero in on the right phrasing and feel. Loop recording can inspire the vocalist to try variations on each pass — those elusive nuances that might not have otherwise emerged without that sense of freedom the performer gets when another record pass is just a few bars away. 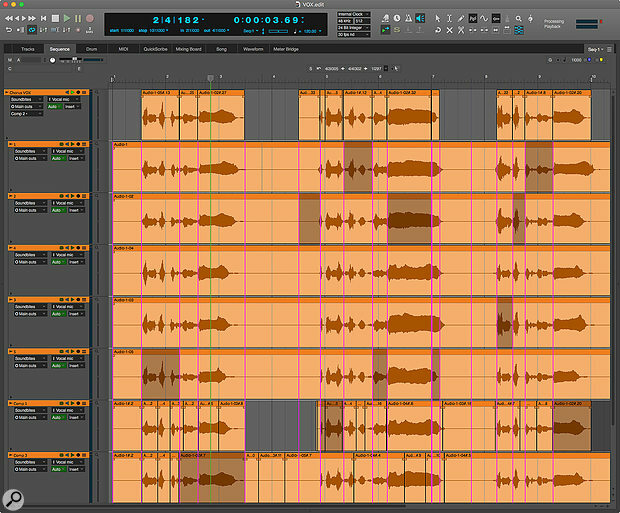 Digital Performer’s Takes feature is designed for capturing, managing and comping vocal takes. To use it during recording, enable Memory Cycle and set the cycle points as needed, then enable Overdub record mode. This causes DP to automatically generate a new take in the track for each record pass. When setting the cycle points, it’s a good idea to add an extra bar or two at the head and tail to allow the vocalist time to reset between each pass. Hit the Record button and go. You can record as much as you want with these settings, starting and stopping as necessary during the session, and every pass is logged as a separate take. The result is a single track with all your takes neatly lined up with each other, ready for comping. My advice is to keep every take, even questionable ones, because they may have parts that fit well with other takes later during comping. Incidentally, if you’ve already recorded multiple vocal passes into separate tracks, you can easily consolidate them into takes. Select the tracks in the Sequence Editor, go to the track settings menu for one of them (or a new empty track) and choose Absorb Selected Tracks / All Takes. In the Track List, you can do the same by accessing this menu setting in the Takes column. What if you need to layer harmonies while looping? Using Overdub as just described mutes each previous pass, making way for the next to be heard on its own. If you need to hear the previous pass for the vocalist to harmonise with it, use DP’s POLAR window, accessed from the Studio menu. Open POLAR, link it to the main transport, disable the Mute previous passes option and create new passes Manually so that you have control over each new pass. Triggering passes automatically with the record gate will probably generate partial passes, which you don’t want to have to clean up later. You can manually mute (and unmute) previous passes with their play buttons, if necessary, during recording. 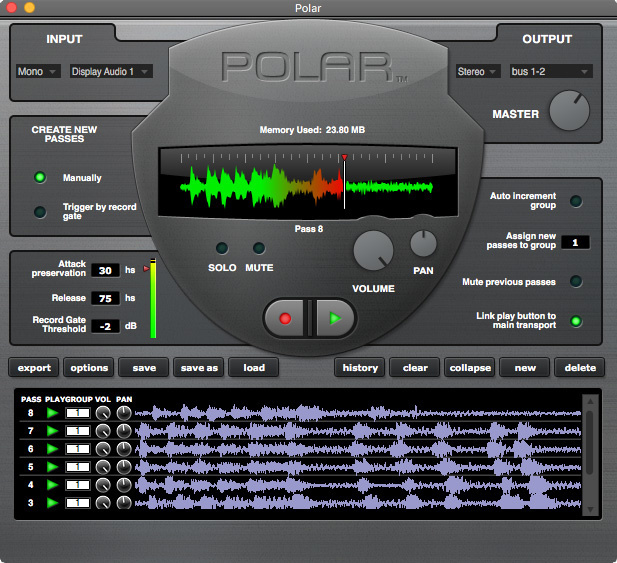 POLAR allows you to build massive vocal stacks in just a few minutes, with each part preserved as a separate take for future editing and comping. When you are finished, click Options, choose to import the POLAR session as tracks using the Add to tracks... option, enable Create Individual soundbites for each pass and click Export. You can then consolidate the resulting separate POLAR tracks into a single track containing takes as described earlier. If you recorded harmonies, consolidate multiple takes for each harmonised part into its own track for further comping. To preserve the entire POLAR session as a separate self-contained file on disk, for future reference, click Save. Screen 3: POLAR (Performance Oriented Loop Audio Recording) is perfect for building vocal stacks because new record passes can be layered on previous passes, while preserving each layer separately. You can consolidate the entire POLAR session into a track with multiple takes, to then build your comp take. When vocal recording in this fashion is finished, you’ll have a single vocal track containing multiple takes. Next, it’s time to assemble the best parts of each take into a composite. To begin, loop DP’s main transport over the section you’ll be working on and solo the vocal track. In the Sequence Editor, go to the track’s Takes menu and audition each take to remind your ears about the raw material you’ve recorded. If there’s one take that stands out as a good baseline, choose it as the current take and then choose Show Takes. This creates a new comp take based on the stand-out take, with all the other takes shown in lanes below it, ready for comping. If there’s no particularly good stand-out, and you’d prefer to start with a new, empty comp take, choose New Take and then choose Show Takes. This creates a new, empty comp take with all other takes below. With all take lanes visible, adjust the vertical zoom height of the tracks so that you can see all take lanes at once. The Comp tool (highlighted in red) in DP’s main tool palette. Now click the Comp tool in DP’s main tool palette. For comping, it’s usually best to disable edit grid snapping at this point, as you probably won’t want to be constrained to the grid. If earlier you chose a take to build on, its lane is now shaded to indicate that it is playing in its entirety in the topmost comp lane. Using the Comp tool, drag over any desired section of another take to add that portion to the comp take. It becomes shaded and you’ll hear it in the comp take as it plays. Vertical dividers appear after you make a selection. Simply click any lane in any column with the Comp tool to shade that section of the lane and add it to the comp. Option/Alt-click on any lane to create column dividers without dragging. Often, it’s faster to ‘click in’ a series of columns at obvious phrase or word boundaries in the waveform, instead of dragging. Then click the sections between the resulting dividers to audition the material in that section. To audition every take for a section (column), simply click the next lane in the column each time around the loop. You can work your way through an entire vocal track this way, from left to right along the timeline. If you encounter pitch problems in material that is otherwise desirable, go ahead and use it, because DP offers the tools to fix pitch issues later. If you’d like to temporarily audition an entire take (lane), click the solo button in its track settings on the left. This makes it play instead of the current comp take. Un-solo to return to the comp take. You can drag column dividers to adjust transitions between slices, or click a column divider to nudge it with the arrow keys or delete it with the delete key. Here’s a special tip: if you want to create silence in the comp take, Ctrl/Win-drag a column divider. To refill the silence, just click any take lane in the resulting column. As a final step in the process, apply crossfades in the comp take (top lane) where necessary to smooth transitions between sections. To apply fades to all edit boundaries in a single operation, select the entire comp take, choose Fade... (Audio menu), choose the fixed-length fade option, the equal power fade preset and 10ms before and after the splice. This should smooth out most of the slice points, and you can manually tweak from there. T Screen 2: If you click on the Takes menu in the ‘Chorus VOX’ track in Screen 1 (which currently shows Comp 2), this is what you’ll see in the Takes menu. Comp 2 is currently selected, and you can see the other takes, plus the other two comp takes, 1 and 3, which can be treated as takes themselves. 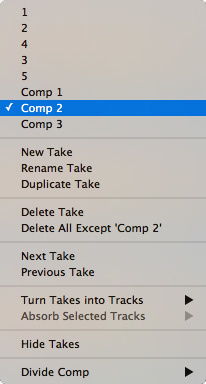 To go back into a comp take for further editing, choose it from this menu and then choose Show Takes. Choose Hide Takes to complete and save your edits.o complete the comping process and save your comp take, choose Hide Takes from the Takes menu. This causes it to appear in the takes menu as Comp 1, which you can rename if you wish. To go back into it, choose it as the current take and choose Show Takes. Use the combination of Show Takes and Hide Takes to go in and out at any time, as needed. Comping can be deeply subjective and highly creative. You might build what you feel is the perfect comp, only to come back a day later inspired to go in a completely different direction. The great news is that you can non-destructively save your comp, as described above, and create another one using the same source takes, either from scratch or from a duplicate of the original comp. 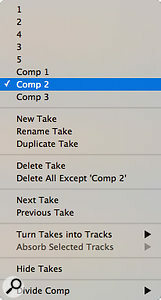 In fact, comp takes appear as take lanes themselves, so you can even use portions of your original comp, or any other comps you may have created, as material for your new comp take — comps within comps, if you will. For example, if you are collaborating on a project, and two or more people are comping the vocals, you can use portions of your collaborator’s comps when creating your own comp, without disturbing their original work. Comping is entirely non-destructive and you can always go back in later to make changes or create variations with Duplicate Take. In a future column, we’ll look at how to build on the comping process in Digital Performer, taking advantage of its built-in pitch correction, harmony generation and vocal processing.